While foliage is lovely to look at, it will eventually destroy everything from roofing, soffits, fascia, siding, etc. This landscaping caused extensive damage to this roof and ceiling of this garage. 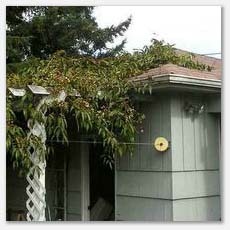 We noted vines had grown all the way into the attic causing leaks and moisture damage. This roof was eventually replaced due in large part to landscaping damage.